Important satirical map of Europe. Karte Von Europa im Jahre 1870 nach einem französischen Holzschnitte./Carte drôlatique d'Europe pour 1870. A rare example of the German edition of Paul Hadol's satirical map of Europe on the cusp of the Franco-Prussian War. This map, covering all of Europe, is a comic panorama wherein the individual nations take the telling form of cartoonish personifications. At the center of the conflict are France, represented as a fierce bearded soldier with a bayonet, and Prussia, represented by the bloated body of Otto von Bismarck. The subsequent conflict between France and Prussia resulted in a powerful unified German Empire and a humiliated France – a situation that set the stage for both World War I and II. Prussia – here represented as an overweight giant is poised to dominate Europe. He has one knee on Austria, who he forced out of power to dominate the Germanic sphere. His right hand embraces the Netherlands. Belgium – this tiny country is squeezed uncomfortably between the giants of France and Prussia. England and Ireland – Here represented as on old woman keeping an eye on but ultimately turning her back on continental Europe. Ireland, appearing as a mischievous cat, is restrained by a leash. Spain and Portugal – A decadent and overweight matron lounges with a cigarette on an uncomfortably dominated Portugal. Corsica and Sardinia – consolidated into the figure of a comic street urchin with elfin characteristics is mooning Italy and possibly the reader. Italy – appears as Giuseppe Garibaldi, the leader of its national solidarity movement. He is looking toward France but boldly holding back the right boot of Prussia. Denmark – is a small but bold warrior standing astride Prussia's right arm. Holstein, recently lost to Prussia, is between his legs. Scandinavia – Norway and Sweden and combined in the form of a panther leaping into the continental conflict. The full meaning of this iconography is unclear, but it is a theme that we find repeated in several subsequent satirical maps, including Fred Rose's iconic Angling in Troubled Waters. Switzerland - is a tiny cottage without doors or windows, clearly suggestive of its characteristic neutrality. European Turkey and Greece – appear to be crushed under the weight of the northern troubles, particularly Austria. Russia – is a frightening and dominating bogeymanlike treat that the rest of Europe seems to ignore. 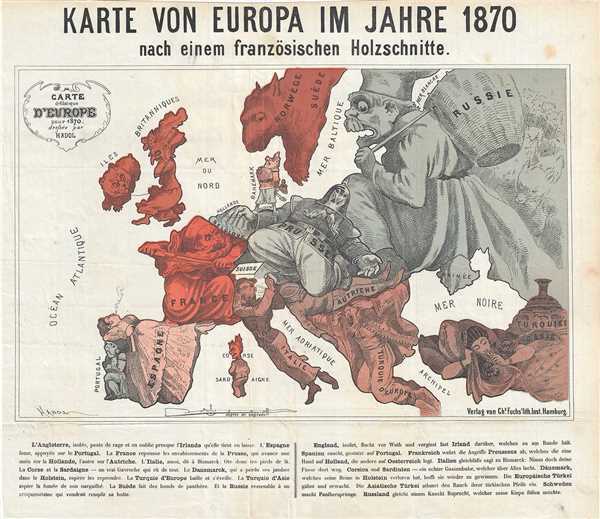 The specter of Russian imperialism appears as a theme in most subsequent European satirical maps. L’ANGLETERRE, isolée, peste de rage et en oublie presque L’IRLANDE qu’elle tient en laisse. L’ESPAGNE fume, appuyée sur le PORTUGAL. La FRANCE repousse les envahissements de la PRUSSE, qui avance une main sur la HOLLANDE l’autre sur L’AUTRICHE. L’ITALIE, aussi, dit à Bismarck: Ote donc tes pieds de là. LA CORSE et la SARDAIGNE. . . un vrai Gavroche qui rit de tout. Le DANEMARCK, qui a perdu ses jambes dans le HOLSTEIN, espère les reprendre. La TURQUIE d’EUROPE baille et s’éveille. La TURQUIE d’ASIE aspire la fumée de son narguilhé. La SUÈDE fait des bonds de panthère. Et la RUSSIE ressemble à un croquemitaine qui voudrait remplir sa hotte. ENGLAND , isolated by rabies and plague, has almost forgotten IRELAND who she holds on a leash. SPAIN smokes, leaning on PORTUGAL. FRANCE pushes back against the encroachments of Prussia , [who is] reaching one hand over HOLLAND and the other over AUSTRIA. ITALY, too, says to Bismarck,'Remove your feet.'. CORSICA and SARDINIA…a real Gavroche (a reference to Victor Hugo meaning street urchin) who laughs at everything. DENMARK , who lost his legs in HOLSTEIN, hopes to reacquire them. TURKEY in EUROPE yawns and wakes up. TURKEY in ASIA smokes her hookah. SWEDEN, a panther, leaps. And RUSSIA like a bogeyman who wants to fill its sack. Satirical or caricature maps existed in Europe from the 14th century (Opicinus de Canestris), but they reached their pinnacle of sophistication in the second half of the 19th century. The genre took the form of humorous political commentary. Some of the earliest 19th century satirical maps, such as Emrik and Binger's and of 1859, merely placed dramatic figures upon the map like giants. As these maps increased in sophistication, the forms of the countries themselves were reimagined as comic figures. One of the first such maps to embrace this new style is Hadol's map of 1870. Subsequent maps by Fred Rose and K. I. Kordig expanded upon and mastered this style. Most such maps were published as independent issues in either pocket map or broadside form, and thus, due to their inherently ephemeral nature, few have survived and are today are all quite rare. Printed by the Charles Fuchs Lithography Institute in Hamburg. Although this map dates from 1870, the printing most likely dates from 1914. Paul-Joseph Hadol (February 26, 1835 – November 26, 1875) was a French draftsman, illustrator, and caricaturist active in Paris during the second half of the 19th century. He was born in Remiremont, France, the son of a barrister. Hadol initial took work as a customs officer before relocating to Paris in pursuit of the 'bohemian' life. There he discovered a talent for caricature and draftsmanship, producing comic art for various French periodicals of the period including Le Gaulois, Le Journal Amusant, High Life, Le Charivari, Le Monde comique, La Vie Parisienne and L'Eclipse. In addition, under the pseudonym 'White,' he drafted comic illustrations for Mailly and Baillard. Hadol work is typically associated with the Napoleonic Third Empire. Hadol also published under the pseudonym 'White.' Much of his work was printed in photogravure by the Paris lithographer Firmin Gillot (October 11, 1918 – June 12 – 1872). Good. Some light foxing. Minor wear along original fold lines. Blank on verso. OCLC 829504729,54639331, 816004910. Lambert, S., The Franco-Prussian War and The Commune in Caricature ,1870-71. Baridon, L., Un atlas imaginaire, 113. Hill, G., Cartographical Curiosities p. 46. Tooley, R. V., Geographical Oddities, MCC1, #75-79.